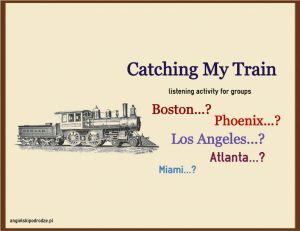 Ask students to imagine they are now at the Chicago Union Station, the major railway station in the city, because they are about to start their journey. On the board write the five destination cities: Miami, Boston, Atlanta, Los Angeles and Phoenix. 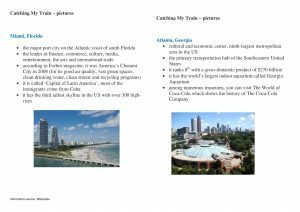 Ask students to think which city they would like to go to and, depending on their choice, go and find the appropriate info card on the wall. This way students form five groups (you may think of a different way of splitting your students into five groups – it is up to you to decide). Now have them read the info texts about their destination cities and, in groups, discuss the reason why they decided to go there (3-4min.). After 3-4 minutes, students in each group say aloud what encouraged them to go to the city. Now tell the groups that they will listen to a railway announcement. Play the recording. You can select one of the two recordings available here: Recordings (click the link to download). Attention all passengers, due to inclement weather, all trains departing Chicago Union Station for Miami, Florida have been cancelled until further notice. Trains on platforms 13 & 27 must be evacuated. Please see ticket agent for additional information & refunds. The 13:05 traveling to Atlanta, Georgia will no longer continue to Orlando as previously scheduled. The train is now arriving at platform 5. Those passengers traveling to Los Angeles on the 13:50, the train will no longer depart from platform 12. 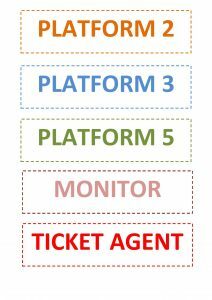 Please proceed to platform 3 for boarding. I repeat, those traveling to Los Angeles, please proceed to platform 3. We are sorry to announce that the daily nonstop 13:10 train to Phoenix, Arizona, departing from platform 2 has been delayed to 15:10, due to a recent sandstorm causing track troubles. Due to demand, we have added an additional 13:20 departure for those traveling to Boston continuing onward to New York City. Tickets are now available for purchase. See monitor for departure information. This has been a special announcement. Thank You for traveling Amtrak Chicago. Serving friendly customers since 1971. Trains that get you there at a reduced fare. 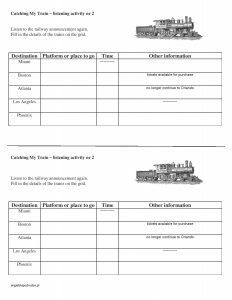 The last step is to listen for details and complete the table which you can find here: Catching My Train – worksheet . Students work individually, but they compare their answers in their own groups.